It took 39 weeks and it has arrived- feeling so exhausted that I couldn't climb anymore on my bike. The week's workouts was alright..I felt exhausted so I didn't over do it although I felt like I was over doing it anyway. That sounds weird I know but if you've trained for an Ironman or am training for one, you know what I am talking about...maybe. Saturday, I had a good 12 mile run...I did it! 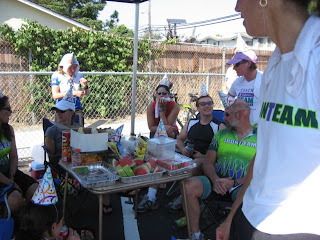 Sunday, the Marin Century route was on schedule and well..let the fun begin! We met at the parking lot of an elementary school early Sunday morning for a 7:30am roll out. I've been in contact with my coaches about me feeling sluggish and exhausted. We first thought it might be my nutrition but Sunday, I figured it was beyond that! We were climbing Big Rock and my quads were just burnt! I was looking forward to mile 50 because that was where Ted and Mike would be with the water stop. On the flats, I felt great but on the climbs, it was painful..actually worse than painful because I can ride through pain but it was a feeling of not being able. I couldn't climb. After the water stop, I attempted to continue but realized I shouldn't so I asked Deb, "Would you be mad if I turned around?" because I didn't want her to ride alone for safety reasons. She said no worries so I turned around and hung out with Mike, Ted and Brian who had a broken spoke on his bike. I have to say..there could have been no better day to get sagged than today! Sitting at the water stop was tons of fun! Ted finally couldn't stand the fact that I still had my helmet on so he unbuckled it. Fine! I'll take off the helmet! Haha. Mike and Ted made fun of Norman Stadler...we talked Tour de France, talked Ironman, talked bikes and then Nick came rolling up on his bike tossing his water bottle to the side of the road like he would at race aid stops haha. After Nick and Vinay arrived at the water stop, we packed up shop and loaded the mini- van up! We drove the remainder 50 miles of the route. Brian and I stayed in the van munching on snacks and acting like kids while Ted and Mike did a fantastic job of a roaming water stop for our team. The real fun came about 15 miles away from the elementary school. Brian noticed Mike's gas empty light. I asked Mike about it but neither him or Ted seemed concerned. AND then the fun came. Minutes after telling me that neither of them were concerned, Mike acknowledges the gas light. The van gas meter said 8 miles to empty but we had about 15 more miles to go! I turned to Brian and said, "We might have to get back on our bikes and we just had ice cream..that won't be good." Long story short, Mike's van made it to the school..through neutral..through a very slow Camry and "rolling" through stop signs..we made it back to the school. Phew! So what's my plan for the fatigue? Training probation for most of the week! What am I going to do with myself?! 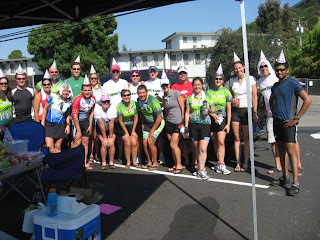 The team with the party hats!